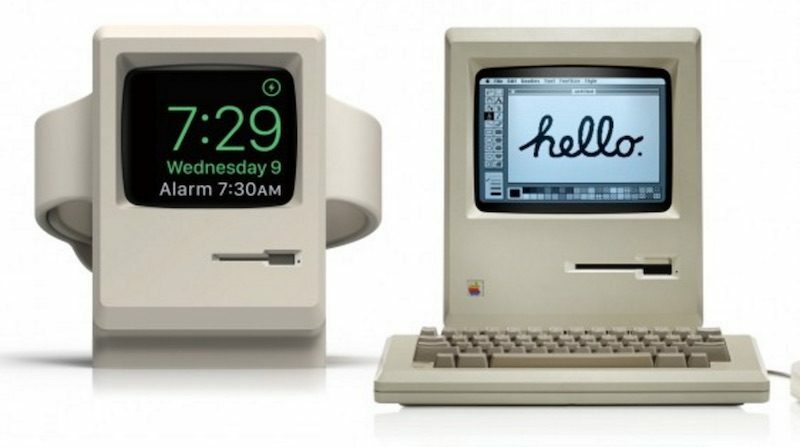 Elago's W3 Stand for Apple Watch can turn Apple's modern wearable device into a classic Macintosh, all while charging and protecting the Apple Watch. 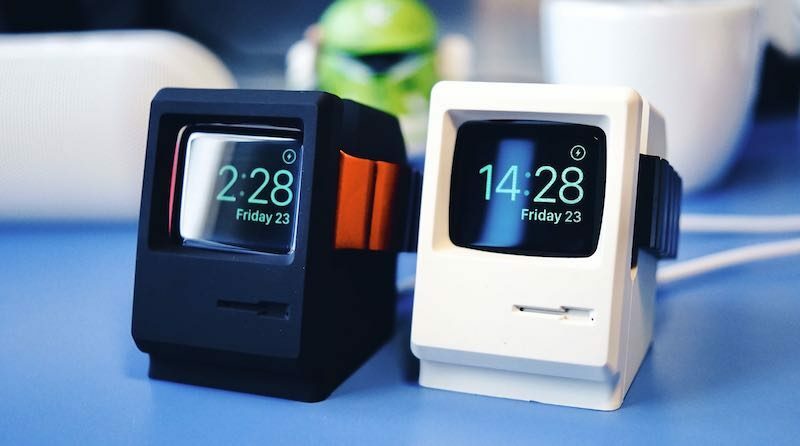 The Nightstand Mode-only accessory has a slot for the Apple Watch's charging puck and a small compartment that you slide the Apple Watch into, turning its 38mm or 42mm display into that of a retro Mac. The dock was originally announced last November, but is just now gaining attention online. To prevent scratching on the Apple Watch's casing, band, and screen, the entire W3 dock is made of soft silicone, also making it easy to place and remove the Watch. The image used on Elago's website appears to use the Stone Sport Band on the Apple Watch, which is now unavailable on Apple.com. Any band and case combination will work on the dock, however. Those interested can purchase the W3 Stand from Elago's website for $13.49, as well as on Amazon for $11.99. An alternate black version is also available. Dammit, this thing is too cute to resist buying! Wish it came with a tiny keyboard, too. For $11 dollars on Amazon, I could not resist. Will have it for the weekend to play with. I can't wait for the comment from my wife - "Arg, you are such a geek." And I will smile say, "yes, yes I am." Would also love to see this in an iMac DV variant (blueberry, grape, indigo, ruby or flower power especially). Funny to think the Apple Watch is far more powerful than the Macintosh in nearly every possible way. 'The original Mac. Now more portable and 10 times more powerful. Watch bands sold seperately.' That statement would surely blow the minds of anyone back in those days. My vote for best Apple accessory. Almost want to buy an Apple Watch so I can get one. That's adorable. I wish a mini keyboard and mouse came with it. Freaking adorable. Needs a mini mouse and keyboard to come with it... also, can we get an Apple logo sticker that's small enough to go on it? $11 should not be £35 (on its Amazon store). How to lose customers and alienate people.